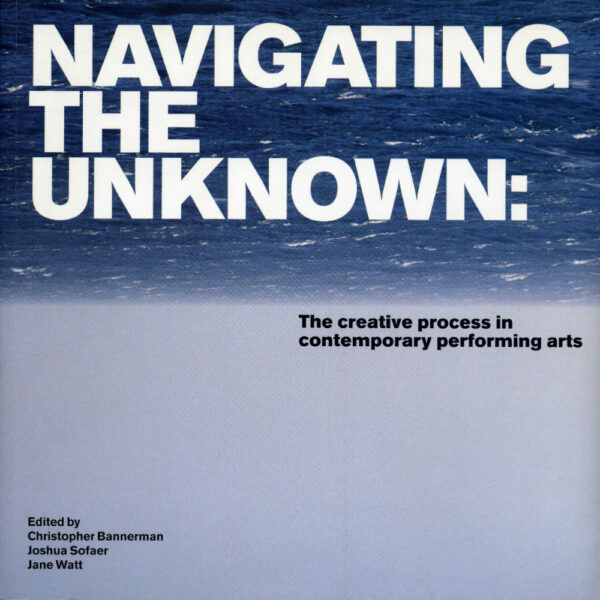 This central section of the book investigates what happens as artists navigate their way through the creative process; what techniques and methods they employ to accompany them on their journey, and what their experiences tell them about making work. ‘All In A Day’s Work’ is a chaired conversation between the ResCen artists which focuses on issues which pertain to the daily practice of creation. Richard Layzell’s ‘Form and Function’ is integrally related to ‘Friction of Forms’ by Caroline Bergvall and ‘Return of the Repressed’ by Adrian Rifkin; these three short texts are conceived as part of the same piece, playing with fictional voices and working methods. Mark Vernon’s essay ‘Plato and the Creative Life’ looks to Plato and his philosophy as a way of reflecting back on the creative process. ‘Expectant Waiting’ by Rosemary Lee considers the importance of waiting as an active creative process. This introductory essay seeks to draw out common strands and contextualise them within a wider social, cultural and artistic framework. The three main strands identified are: the dramatisation of creative thought as a way of producing knowledge, in other words performance itself as knowledge; collaborative practice as a kind of alternative family; and, the power of negative preference, where not knowing and not doing are forms of productive engagement. On the journey that an artist makes in the creation of contemporary performance, from the initial idea or commission to the manifestation of that work in a public engagement, a series of choices are encountered and a set of decisions are made. This ‘tying yourself to a particular choice,’ as Shobana Jeyasingh conceives it, is ‘always a moment of suffering’ . This suffering arises from the what might have been and the if only, a kind of retroactive configuring of the future possibilities of the work that isn’t about to be made, that results from the decisions that were discarded. This is the theme taken up by Peter Howitt’s 1992 romantic comedy Sliding Doors where we watch parallel storylines in which the central protagonist catches and misses a tube train, two radically different narratives played out as a result of a split-second decision to run for an embarking train or to wait for the next one. But the suffering engaged by the creative decision-making process is not just about the what if; more prosaically, it is about the act of making the decision. How do you make choices? Graeme Miller’s dramatisation of thought is for his own purpose. He is the audience of his own performance . The Spock/Kirk dynamic is not merely a metaphor for the struggle to make decisions but rather a practical creative strategy engaged to determine solutions. The dramatis personae who take up the challenge are selected for their personal characteristics and their designated roles. Captain James T Kirk of the USS Enterprise – the man in the driving seat – embodies the ideal ‘doer’. According to his official biography he is ‘an independent whose success couldn’t be argued even though he often bucked the system’ . He is the man of valour, the patriot who sacrifices his personal freedoms for the greater good, acknowledged by many awards and commendations including the Starfleet Citation for Conspicuous Gallantry and the Karagite Order of Heroism. Mr Spock, First Officer and later Commander – the problem solver – is, on the other hand, the cultured scientist, and embodies the ideal ‘thinker’. Half human (his mother Amanda was a school teacher) and half Vulcan (his father Sarek was a diplomat), Spock’s role is to pose questions and offer suggestions. Torn between his emotional human side and the strict (genetic) discipline of his Vulcan heritage, Spock is in the prime position to offer many potential readings of a particular situation. The generosity of his purpose is exemplified by the fact that prior to his death he ‘mind-melded’ with his Starfleet colleague Dr Leonard McCoy, to transfer his ‘katra’ (his spiritual essence) so that it might be put to future use. This mind-melding is, perhaps, a useful way to think about what is happening in the staging of Graeme Miller’s creative process. It is the intervention of somebody else (albeit a fiction) and the detachment from self, within self, that produces solutions. While I do not want to suggest that Miller sits in his studio muttering to himself in Vulcan (he may, or may not, be so literal in his application) the Spock/Kirk ‘method’ works partly because the characters’ voices are already so well developed in their on-screen performance. By imagining what they might advise him to do, metaphorically or otherwise, Miller taps into a kind of predetermined performance script that is handed to him already written. What is so striking about Dr Spock’s text is the way it overtly encourages performance on the part of the parent. The first chapter of Baby and Child Care is titled ‘The Parent’s Part’, as if parenting was literally a role or character to be studied and subsequently enacted. This actor/character methodology is extended even to encompass a performance of the child itself by the parent, as in, for instance, this account of why urging a child to eat is unreasonable and likely to cause problems. The parent is thus asked to act not only in the role of parent but also as the child they parent. This staging of multiple positionality is similar to the Spock/Kirk dynamic that Graeme Miller describes, where the different sides of an argument are played out. The everyday as performance is not something unique to the raising of children nor to the creative process, and of course it would be possible to read practically all actions of daily life as interpretations of pre-set performance scripts. With regard to parenting it is useful to think of how the child, even the adult child, sees its parents precisely on these terms, which is to say as ‘mother’ and ‘father’ (with the concomitant expectations of their performance that such roles inevitably bring) rather than as ‘people’ in their own right. The child understands the parent in relation to themselves. The role of ‘mother’ particularly, occupies a position of performative expectation where the compulsory heteronormative matrix – gendered as ‘mother’ – is enforced. The mother’s role has been defined (and redefined) from culture to culture and epoch to epoch; it has, nevertheless, been defined. The performance of gender, of which motherhood must surely be the ultimate representation, is one where women are asked to play particular roles in order to enforce certain ‘norms’. Motherhood demands that the woman produces her child not only biologically but also socially . Her performance gives rise to that of the child. But whereas the social performance of the person-role formula in our everyday actions has, as Butler conceives it, to do with the repetition of oppressive and painful norms (and not just gender norms) to force them to resignify, the use of performance as a technique in the creative process is precisely about the radical choice that is denied in the social context. Performance itself, or the enacting of roles, is an engagement which gives rise to knowledge. It is this understanding of performance as a form of knowledge which is at the heart of the ResCen project. The element of detachment when dealing with somebody else’s work that Miller internalises through the Spock/Kirk role-play device, is embodied by Richard Layzell’s collaboration with Tania Koswyckz. Responding to a commission from the firstsite gallery in Colchester to create an installation which would ‘reveal artists’ practices’ Layzell invented a group of four artists and made their work for them . In this way Layzell deconstructed the creative process through the creative process; a kind of making while being detached. Back in his studio after the exhibition had closed, Layzell found himself missing the method and ease of making Tania’s work, and so he decided to continue fabricating work as Tania. This process gave rise to a relationship in which Richard and Tania provoked each other precisely because they had differing points of view. Richard would ask Tania what she thought about something and found her advice useful and provocative. These ‘process’ conversations eventually became an integral part of Layzell’s ‘product’. In performances Richard began to speak directly to Tania, later their conversations were published . In other words, one of the solutions which Layzell found to answer the challenge of making decisions, that is the dramatisation of creative thought through the creation of a dialogue with an invented collaborator, became the very stuff of which the decision-making process was set up to answer. In this publication the published conversation Richard ‘has’ with Tania, in which they discuss their working relationship, has been given over to two other writers who take up the baton of the fictional voice and not only rethink it but also fictionalise its creator. Caroline Bergvall subtly critiques what might be sociologically at stake in the relationship between Richard and Tania, especially with reference to the implied gender dynamic, by interrupting their dialogue with the ghost of a fictionalised Ana Mendieta. Ana Mendieta was the wife of the sculptor Carl Andre (a sculptor to whom Layzell makes allusion in his dialogue with Tania). Mendieta was a performance artist who came to an untimely end. In 1985 she fell to her death from the window of her 34th floor apartment. Andre was tried and acquitted of her murder but the circumstances of her death are still (seen as) mysterious. The story of her ‘disappearance’ – a terrible ending – has, in many discourses, eclipsed the importance of her work as an artist; as her work as an artist was eclipsed by that of her husband when she was alive. By raising her ghost and implicitly citing the discourse of her disappearance, Bergvall talks to this power dynamic between artists and sexes. This ghosting of Layzell’s text, and also of him (Bergvall puts words into Richard’s mouth) doubles the fictive narrative by engaging with the process of Layzell’s art practice as Bergvall’s own. Bergvall tests not only Richard’s relationship to Tania and Layzell’s relationship to the text, but also Bergvall’s relationship to Layzell. Richard Layzell worked ‘in dialogue’ with Caroline Bergvall on the development of his conversations with Tania. They too have a history of a working relationship. In an open-letter come telephone-call monologue (a deliberate ‘fluff’) from his own invention Davida Pendleton to both Richard and Tania, Adrian Rifkin both contextualises this device of staging a fictional voice and parodies its effects. Subtitled ‘The Torment of Davida Pendleton’, Davida’s rant on behalf of her creator (or is it his rant on her behalf?) reveals her jealousy of Richard’s attachment to Tania and the collaborative partnership they have developed, in contrast to her infelicitous relationship with Adrian whom she sees as promiscuous. Rifkin resituates Bergvall’s critique of the gendered relations between Richard and his creation Tania, by giving voice to the disgruntled dissatisfaction of his own creation, who perceives Tania’s relationship with Richard as one to aspire to. By sending up the absurdity of these literary encounters, in part through the multiplication of confusion (for instance, we discover halfway through the ‘invented’ Davida’s diatribe that her name ‘Davida Pendleton’ is in fact an invented ‘pen name’) Rifkin points to the fact that it is in the absurdity of the encounter that the creative use and productivity is to be found. It is in the very context of this publication then, that the techniques employed by an artist to navigate through the creative process, in this case the invention of an artist to collaborate with, has the potential not only to become the ‘work’ itself, but to be incorporated as a provocation to other artists and writers for work of their own. The process of handing over his dialogue for reinvention that is enacted by Layzell to Bergvall and Rifkin recognises another important theme of this chapter: artistic collaborations. Although always a necessary part of even the most solo of performance practices, collaborations are often at the forefront of the practices described here. Richard’s collaboration with Tania, although physically manifest in one corporeal body, nevertheless underlines the creative potential of working relationships. This is something that is played out when Layzell hands his text to Bergvall and she hands both hers and his to Rifkin. There is a certain risk involved in this strategy of handing over and giving up; risk of authorship, risk of censure, risk of the unknown. Ghislaine Boddington has made collaboration central to the development of her creative strategies. As she makes clear in the conversation which follows this introduction, for her it is through confrontation with colleagues and the direct sharing of material that the most productive working methodologies are to be found. As she says: ‘If you decide to share material as a group, then you own a set of content which can be used in multiple ways…’ . This sharing is manifest literally in a virtual holding space, where members can give or take ideas, as need or desire dictates. This alternative family as a creative way of life is explored in Mark Vernon’s essay ‘Plato and the Creative Life’. Vernon gives us an account of some of the issues at stake in Plato’s dialogues which very usefully reflect on the creative process. At the heart of Plato’s idea of philosophy is the idea of collaboration. Plato himself, as Vernon points out, only ever writes in other people’s voices and ‘never once unequivocally signs off a single sentence as his own definitive belief’ but rather ‘insists on attributing what he writes to other people’ . Vernon argues that vital to the navigating process itself, for both artists and philosophers alike, is the formation of a creative way of life. That way of life is one in which the collaborative process amongst friends and colleagues is situated outside the conventions (Plato might also say the distractions) of family life. For Vernon it is in the dramatisation of creative thought through the dialogues, what he calls ‘philosophical dramas’, that philosophical thought is produced. In other words, as in Miller’s Spock/Kirk method and Richard’s conversations with Tania, the very staging of an idea brings it into being. Plato’s philosophical premise is the limit of his knowledge: his ignorance. It is his search for wisdom in relation to ignorance that offers the potential for ‘self-transformation’, which Vernon sees as one of the goals of philosophy. In her essay ‘Expectant Waiting’, choreographer Rosemary Lee writes about the potential for transformation in the devising and rehearsal process, through the act of waiting. Waiting might common-sensibly (at least to this lay writer) be understood as the opposite to dance, as everything that it was not. Waiting in this context is not an aesthetic consideration as John Cage might consider silence in music, but rather waiting as an active process of reception (‘…rudderless but not lost…’ so that things can ‘creep up unawares’). This is active waiting, engaged to effect some kind of transformation. It is not aesthetic but strategic. As Lee writes: ‘This state, though, is far from passive: it is a state of acute attentiveness and relaxation’. It is a negative preference for movement without rejecting the power of movement. Negative preference without outright refusal and the notion of waiting for something to appear is embodied in the ‘I would prefer not to’, which is the repeated answer of Bartleby, Herman Melville’s character from the short story of the same name. Bartleby is a scrivener: a writer, a copyist, a scribe. His logic of preference, a negativism without outright refusal, leads to the paradox that he is a writer who does not write . In his essay ‘Bartleby; or, The Formula’, Gilles Deleuze argues that while Bartleby’s phrase ‘I would prefer not to’ is grammatically and syntactically correct, it has the affect of being agrammatical, that ‘it has an anomalous ring to it’ . Linguistically its affect is neither constative nor performative; it neither describes something nor performs an action. Bartleby’s logic of preference places his speech not only at the limit of social convention but also at the limit of understanding. The core of Bartleby’s negative preference is his preference not to write. The reason – that he would prefer not to – while comic, ostensibly robs Bartleby of his vocation and thus his identity; he is after all, a scribe who has stopped writing. But as Giorgio Agamben argues, it is paradoxically the arresting of his vocation which offers its potential and identifies its power. Writing, like creation itself, issues from nothing. Bartleby’s immobility, his silence, his putting down of the pen, performs him. As Bartleby is a writer who has stopped writing, so Rosemary Lee is a choreographer – a movement specialist – who, as a key part of her creative process, prefers not to move. Movement comes out of nothing. As the scrivener becomes the writing tablet, the dancer becomes stage. There is another negative preference that has, at different times during the ResCen project, been relevant to all the artists involved; the preference not to ‘talk out’ the navigating process during that process, for fear it will disappear. Part of Lee’s waiting for an idea is the ‘…hoping it will appear more fully formed if I touch it less with my mind’. While psychoanalysis has taught us that the ‘talking cure’ will rid us of our demons, these artists have all expressed, at some time or another, the concern that intellectualising the creative process, while useful and important when separated from the process, offers the danger of intellectualising it away; that the magic will disappear and the work become worthless. Ultimately, the journey that an artist makes in the creation of contemporary performance, from the initial idea or commission to the manifestation of that work in a public engagement, seems to be about erasure and forgetting. Perhaps it is only through amnesia that the creative process can be renewed to move on. See ‘All In A Day’s Work’ which follows this essay. ‘All In A Day’s Work’. References to Spock and Kirk are to characters from the long-running television series Star Trek which spans over 726 episodes since 1966 and ten feature films, to date. Elsewhere Miller has described the imagined audience for his work as ‘an audience of Graeme Millers’. See ‘Outside Looking In’, transcript of seminar at Conway Hall, London, 15 June 2005 at http://www.rescen.net. See http://www.startrek.com [accessed 8 December 2005] from which this quote and other biographical details about Kirk and Spock have been taken. See Richard Layzell, ‘Tania’s Space’ in Digital Creativity Vol. 5, No. 2. for an account of this process and also Richard Layzell’s ResCen Pages at http://www.rescen.net. A range of different conversations between Richard Layzell and Tania Koswyckz are published at http://www.rescen.net. ‘Interauthorship’ is a term used by Boddington to describe collaborative process creations. See http://www.rescen.net. Mark Vernon, ‘Plato and the Creative Life’ in this volume. The phrase ‘logic of preference’ is used by Gilles Deleuze in ‘Bartleby; or, The Formula’, in Essays Critical and Clinical by Gilles Deleuze trans. by Daniel W. Smith and Michael A. Greco (London: Verso, 1998).